Get pumped up for the annual Las Vegas Bowl at the pep rally on Friday at Fremont Street Experience. Bands, cheerleaders and mascots from San Diego State and Houston will entertain fans, alumni and football lovers from 6 to 7:30 p.m. on the First Street Stage. The Sin City Sinners will host their annual Christmas in Vegas toy drive and concert Friday at the Hard Rock Hotel. Doors open at 9:30 p.m. at Vinyl. There is no cover, but showgoers are asked to donate a new, unwrapped toy. Toys will be collected by the Marine Corps for Toys for Tots. Check out sounds by music producer and Off-White designer and founder Virgil Abloh when he DJs Friday at XS Nightclub. Doors open at 10 p.m. at Wynn Las Vegas. 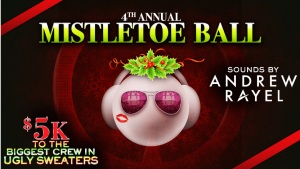 Marquee Nightclub will host its fourth annual Mistletoe Ball on Monday. The event will feature sounds by Andrew Rayel and a $5,000 prize to the biggest crew in ugly sweaters. Doors open at 10:30 p.m. at The Cosmopolitan of Las Vegas. Red Rock Resort will host Rock Shot Bingo on Thursday. The session will be hosted by Bryan Chan and feature DJ Shai Peri. The fee is $25 and includes 10 electronic bingo games, shots and prizes for winners. Doors open at 8 p.m. and the session begins at 9 p.m.